From the outside, the world of the modern musician may be perceived to be one of tour busses, jet setting, swimming pools and all the glitz and glamour of the celebrity lifestyle. Peel away that wafer thin and largely false veneer and you will find an army of jobbing musicians whose life is more about long haul driving, budget air travel, all night diners, playing venues the size of closets and generally making ends meet. What do they call them again? 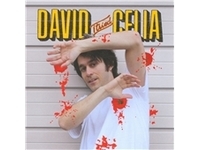 That’s it…normal, hard working people, and one of the hardest working of the lot has got to be Toronto troubadour, David Celia. After turning many heads with his previous albums, Organica and This Isn’t Here, his latest offering seems to distil all that is best about him in one fine, intoxicating drink. Although a lot of the album, I Tried, is rooted in a sort of pop-country style, each song seems designed to push the boundaries further from that classification until a whole host of genres have been ticked off. Yet the skill of musical exploration lies in the art of managing to retain cohesion, that all these musical dalliences sound like they belong on the same album. They do. Eclectic enough to keep it interesting and definitive enough to sound familiar. Although the album opens with some straight forward, yet memorable, pop hooks it is soon off on a wonderful tangent with the Summer of Love inflected, psych-pop of Sergio and Running out of Time and the almost Wodehousian soundtrack that is Severine. Peppered throughout are songs that highlight his trade mark humour, the best being I’m Not Texan, where he rallies against country music being some sort of redneck bastion and proving that Honda driving, Canadians of Croatian lineage can do the job just as well. There is even room for tongue in cheek philosophy in the form of Bug’s Apocalypse, a gentle, lilting ballad with a killer lyrical punch line. And it’s not just about the music, great though that is, lyrically there is much to be appreciated in it’s eloquent charm and totally accessible fashion. Celia is quite obviously singing about his everyday observations from an everyman world viewpoint. I have never really understood what these over inflated music stars mean when they talk about “keeping it real” but I would like to think that in an ideal world, when you looked the phrase up in the Thesaurus, it would have a picture of this album. All in all a brilliant offering, dripping with upbeat wit, whimsical wisdom and a heady balance of panache and understated elegance.